Ivan Sproule has appealed for the help of Scottish football after his Irish club was “left on its knees” by a storm which wrecked 40 years of investment. The former Hibs star admitted being devastated as he saw grown men in tears as they saw a lifetime’s devotion to Ardstraw FC swept away by torrential rain. Sproule, who took over as boss of the Tyrone club in Northern Ireland’s third tier only a few months ago, reckons it will cost as much as £60,000 to repair the damage caused. 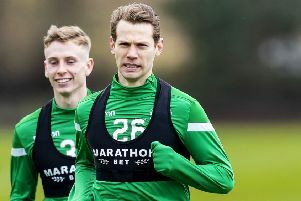 Already former Easter Road team-mate Scott Brown has answered his call for help, the Scotland captain promising his strip from Friday night’s World Cup qualifying match against Lithuania to be raffled, while Sproule has also been in touch with Hibs and others he played with in a career which also saw him turn out for Bristol City and Ross County. The crippling blow came only days after Ardstraw had kicked off their Irish Cup campaign with a 10-2 victory over Richhill, Sproule claiming two of their goals and his brother Andrew five. He said: “Things had been going really well, we’ve built a good side, one with lots of fantastic young players – I’m the old codger in it. “But this has left us in a very bad way: fencing, the goalposts and equipment have all gone. The clubrooms were flooded – we don’t know when we can get back into them – and we’re still waiting to find out if our floodlights still work. “We are not a top club, but it has been built up over the past 40 years, trying to do our best and the facilities we had were as good as any in the Irish League including two floodlit pitches; that’s the reason why a lot of players have signed for us. “Like in many small communities, the football club is the heart and soul of everything. You go and work during the week and on a Saturdy afternoon the whole family comes along to the game. “A lot of them stand watching the match knowing they’ve put in plenty of hard work to take the club to where it is; for some of them it’s been a lifetime of devotion, if you want to put it that way, and to see it all taken away so suddenly like that was devastating, the club has been left on its knees. “People who have lived here say they’ve never seen destruction like it, apparently the last time there was a flood like this was in 1985. I went to a management meeting in the wake of the flood and it was heartbreaking for me to see grown men who’d worked so hard with tears in their eyes seeing those years of effort had all been swept away. Clean-up operations have been going on to remove the debris left behind with Sproule hoping the money spent on improving the drainage will help limit the damage but, he admitted, it could be an uphill struggle for the next couple of years. Ardstraw have been in touch with the FIA and UEFA while they wait to learn how they stand in terms of insurance but Sproule, as the manager, believes it falls on him to play a leading role in fundraising, the 36-year-old determined to use the contacts made during a career which took him from part-time football in his homeland, to Easter Road, the international stage and beyond. He said: “I do not like begging, but sometimes needs must. Scotty has already promised me his Scotland jersey, I’ve been in touch with the likes Steve Davis, the Northern Ireland captain, and Lee Trundle who I played with at Bristol City. “I’ve been in touch with Hibs to ask if they can help in any way. The response I’ve had from my former team-mates has been brilliant, promising to send something to raffle, but it is all about raising awareness. “Anyone who has been involved in a small club anywhere in the country knows how hard it is to survive, how tough it can be when they suffer a big problem. I’m sure no-one would want to be going through what we’re going through at the moment. Offers from closer to home have, of course, been made, one option being to play games elsewhere in the meantime but, revealed Sproule, the devastation wreaked has a far deeper impact with Ardstraw boasting more than 200 youngsters in their academy. He said: “Other clubs have offered us a pitch until we get back on our feet but we’ll see how things pan out before we take them up on that. “We’re lucky in that with our season starting with the cup our first three games are away from home which will perhaps give us time to sort out the changing-rooms. “But we run three senior teams and have all these kids in the academy who have been left without any football. “I was over at Bristol City only a couple of weeks ago trying to forge a link with them because we have so many good young players here.